One of the most common types of injuries that occurs in the workplace is hearing damage. Millions of people experience some type of hearing loss, ringing in the ears, or other issues related to being exposed to loud noises at work. Unfortunately, this type of hearing damage can occur over the course of months or even years, so people don’t notice it is happening at first. To help combat this huge problem, OSHA has issued a number of requirements that employers must follow regarding hearing protection. OSHA’s standards are laid out under the standard number 1910.95, which covers occupational noise exposure. Learning about these standards is not only important for remaining in compliance with the government regulations, but also for ensuring employees are given the protection they need. There are two types of hearing risks associated with loud noise. The first risk is a sudden spike in loud noise. Things like gunshots or explosions fall into this category. The other type is a prolonged noise that is significantly louder than normal. Both of these possibilities are very dangerous, but what may be surprising to some is that the prolonged noise exposure can actually be more dangerous at lower levels than the sudden option. Facilities need to identify all potential sources of noise, determine whether noise levels are potentially dangerous, and then implement safety standards to protect their employees. Sudden bursts of noise can cause immediate hearing damage, which is why they are such a serious risk. In addition, due to the nature of this type of noise, people are often unable to prepare for it ahead of time unless it is a planned event. In the workplace, these types of sudden loud noises often come from machine presses that slam down to shape metal or other objects. The noise can easily surpass 120 dB, and the louder the noise is, the more damage it will cause. As with all noise pollution, the closer someone is to the source of the noise, the louder it will be, and therefore the higher the risk of experiencing hearing loss or other damage. Any facility that has a machine or other object that causes sudden loud noises will need to make sure there are signs and other notifications stating people should wear hearing protection at all times. Prolonged noise exposure is typically quite a bit lower in terms of dBs, but it is no less dangerous. Most manufacturing facilities have noise at all times, which means employees are unable to find any relief from the sounds. One thing that makes this type of exposure particularly dangerous is that after just a couple minutes, most people will get used to the noise and barely even notice it. Just because someone doesn’t notice the noise, however, does not mean they are not damaging their hearing. People who work in loud environments without sufficient hearing protection will likely experience permanent hearing loss, tinnitus, or other hearing-related problems that can affect them the rest of their lives. The damage from loud noise exposure is based on how long the exposure lasts and how loud the noise actually is. OSHA has identified how long someone can be exposed to different levels of sound without hearing protection before it becomes unsafe. Keep in mind these are the limits stated by OSHA. Most faculties will want to provide their employees with proper hearing protection at levels and durations significantly lower than those in this list. 90 dB – Environments that have consistent noise below 90dB do not have to provide hearing protection unless an employee will be exposed for 8 or more hours. 92dB – Any employee who will be exposed to noise at this level needs hearing protection if exposed for 6 hours. 95dB – At this level, it is safe to be exposed without protection for up to four hours. 97dB – At 97dB someone can be exposed to the sound for up to three hours without hearing protection. 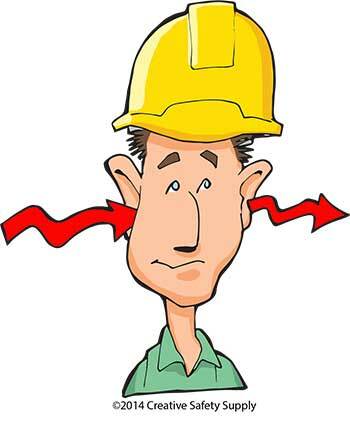 100dB – 100dB is only safe for about two hours, according to OSHA. 102dB – At 102dB, someone should get protection if they will be exposed for more than 1.5 hours. 105db – People in this environment for one hour need hearing protection. 110dB – It is only safe to be around 110dB for 30 minutes or less before hearing protection is needed. 115dB – Noise at this volume is only safe for up to 15 minutes without protection. When your workplace is cluttered, processes aren’t as efficient as they could be. This free Quick Guide to an Organized Workplace covers simple tools and strategies you can use to keep workbenches, storage areas, work cells, and other locations organized and looking professional. Anything above 115 dB requires that the employees wear hearing protection, even if they are only going to be exposed to it for a brief time. Having earplugs or other types of hearing protection available at the entrance to an area that has loud noises is an effective way to remind employees of the risk and the requirement to take proper precautions. OSHA sets requirements for how long someone may be exposed to loud noises and for when hearing protection is needed. 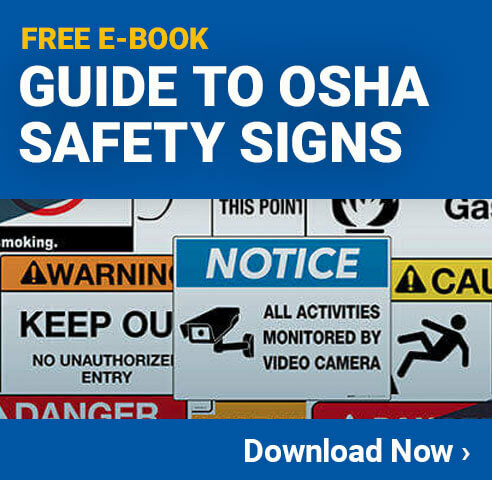 In general, OSHA doesn’t say exactly how an employee must be protected from the sound. Different situations are best served by different types of hearing protection. Noise Absorbing Panels – Installing noise absorbing panels throughout the facility can help to dramatically reduce overall noise levels. These panels can reduce or eliminate echoes, which are a big source of noise. Mufflers on Machines – Machines or vehicles that have gas engines on them can be very loud. Having a muffler installed can reduce the overall noise levels. Modernizing Machines – In many cases, newer machines run much quieter than older ones. Consider replacing machines or bringing them up to modern standards to reduce noise. Containment – Locating particularly loud equipment in a soundproof room can help reduce the noise in the rest of the facility. In many cases, these machines can be operated by someone outside of the room, which reduces the noise levels for everyone. Earplugs are one of the oldest forms of hearing protection, but they are still very effective. Earplugs are accepted by OSHA as a form of hearing protection and are sufficient for environments on the low level of the scale where hearing protection is needed. 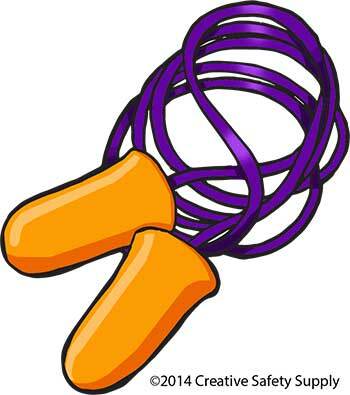 Earplugs are extremely inexpensive to buy and are disposable in most cases. Employers can put out large containers of them for the employees to wear when entering loud environments, and then employees can discard them when leaving. This is one of the easiest and most affordable ways to remain in compliance with OSHA requirements. Earmuffs are designed to fit over or around the head and then cover the entire ear rather than just going into the ear canal. A properly fitting pair of earmuffs can provide a tremendous amount of protection since they stop the sound from entering the ear at all. There are many levels of earmuffs on the market, each designed to stop a different amount of noise, so it is important that the right type is chosen for the right situation. Of course, these are not the earmuffs designed to keep people warm. They are made to stop noise from getting to the ears. Some types of highly advanced earmuffs are actually built with a microphone on the outside and small speakers on the inside. These earmuffs can “listen” to the environment and replay sounds at a safe volume to the person wearing them, eliminating much of the noise in the process. This makes it possible for people to talk freely in loud environments, without being at risk of hearing loss. People who work all day in a loud environment often benefit from these options since in addition to preventing hearing damage, it is important to ensure everyone is able to communicate with each other to avoid other types of problems. To remain in compliance with OSHA requirements, a facility needs to monitor noise levels on a regular basis. Specifically, any time there is a change in the type of work being done or the type of machines in use. Measuring how loud an environment is should be done at a number of different points throughout the facility. This is important because noise can be significantly louder or softer depending on where someone is standing. If OSHA does an inspection and they find that one area of the facility is above the level at which hearing protection is required, a facility will get a citation if the employees aren’t using hearing protection. In addition to monitoring the noise levels and providing hearing protection to the employees, it is also necessary to notify every employee that works in one of these loud environments of the risks. OSHA makes it clear that employees need to know all the risks associated with a given job, including risks associated with noise pollution. Employers need to have a free audiometric testing program set up for the employees working in an environment where they are exposed to noise above the levels deemed dangerous. Having employees get tested at least once per year can identify if and when employees are experiencing hearing loss. If employees are showing signs of hearing loss, action must be taken immediately to address the problem. This often means taking steps to ensure employees are properly utilizing the hearing protection available to them.